I admit that this verse from The Rolling Stones’ famous song “Paint it Black”, came to mind when I saw the title of Professor Constantine Nomikos Vaporis’ book, Tour of Duty. I couldn’t help but to make a connection between the book title and the song, as it was the opening theme for an old American television show called “Tour of Duty”, about a group of U.S. soldiers tearing through the jungle on search and destroy missions during the Vietnam War. In Professor Vaporis’ book, you won’t find ‘Charlie’ or stories about jungle firefights, but you will find a fascinating book that delves into a completely different kind of tour of duty— samurai military service to their feudal lords during trips of alternate attendance to the Shogun’s capital of Edo. A system of alternate attendance called sankin kōtai was the Shogunate’s fundamental means of control over the more than 240 or so feudal lords (daimyo) that ruled the patchwork of individual fiefs that comprised Tokugawa period Japan. In a basic definition, sankin kōtai forced daimyo to alternate attendance between their fief and Edo for periods of about a year on a biennial basis. While in Edo, the daimyo were expected to serve a variety of functions within the shogun’s court. Upon returning to his fief (han), the daimyo’s wife and children remained in Edo as permanent hostages—an insurance policy designed to make a daimyo think twice about participating in an act of rebellion against Tokugawa authority when back in his home domain. Also, the monetary funds needed to support these costly trips as well as maintain luxurious mansions and barracks within Edo, gradually diminished the ability of the daimyo to spend han wealth on military buildups that could threaten neighboring domains or the Shogunate itself. In his introduction, Vaporis explains that sankin kōtai is perhaps the greatest achievement of the Tokugawa period’s leadership as the system intentionally or unintentionally encouraged the development of political, economic and social institutions and practices that helped keep the unprecedented 250 years of internal peace. Sankin kōtai also played a part in the development of the Edo period’s rich cultural heritage. Vaporis states that it is because of the blatantly obvious significance and impact of sankin kōtai, historians have only discussed it in very general terms that haven’t changed much over time. There is really no single book or volume on the subject that sums it all up. To try to write “that” book would require a massive scale of research that could not be so easily carried out, especially as there aren’t any existing full complements of primary resources in han histories that neatly explain and tie everything together. The sheer weight of the project would sink even the best researcher/historian’s ambitions. It is therefore quite easy to understand why historians discuss sankin kōtai in broad strokes or look at specific aspects of the system and the lives of those it affected. With Tour of Duty, Professor Vaporis doesn’t try to deliver a banal and sweeping treatise on the topic, nor does he zero in on a one dimensional, miniscule aspect of it either. What he has delivered is a rich, 24k creation that I truly admire. This is a very insightful and well-construed book that clearly highlights Professor Vaporis’ skills as a researcher and his ability to convey his findings in a straight-forward, easy to understand fashion. After skillfully panning and sifting through various primary source material scattered throughout diaries, journals, artistic depictions and archeological sites to find valuable content, Vaporis then forged and polished what I would describe as a golden ingot that brilliantly shines some much needed light on how alternate attendance, as a political institution, touched the lives of the samurai who participated in it. Roughly, the first half of the book deals primarily with the preparations for the round trip journeys to and from Edo and life on the road, as part of a daimyo’s procession. Readers are treated to a wealth of valuable information ranging from summaries of contemporary journal accounts to tables filled with facts and figures that clearly illuminate just how important of a role alternate attendance played in the deployment of a domain’s human and financial resources. Also, the insightful analysis provided on the pomp and circumstance of daimyo processions is fascinating and definitely stands out as one of the highlights of this book. Vaporis describes these processions as “theatres of power” as they combined the intricacies of domain power projection with a certain amount of drama that both awed and entertained those who witnessed them. The second half of the book covers nearly all aspects of samurai life while on duty in Edo, ranging from financial considerations, issues of place and space within the various types of daimyo compounds, and everyday things like diet and hobbies—including intellectual and cultural pursuits. All of this was really quite interesting and the tables provided of purchases made by individual samurai during their trips to Edo helps to put a human face on those who served in Edo so long ago. These weren’t just stoic samurai, but actual people with real consumer-driven wants and needs. Often overlooked, is the role samurai played in what Vaporis coins, “carriers of culture”. He points out that many historians will talk about the uni-directional flow of culture into Edo and its refinement there, but he argues that the flow of culture was a two-way street. Samurai, when traveling back to their native domains, acted as carriers of culture that they came into contact with whether it be in Edo or via traveling through other domains. In essence, Vaporis says that the system of alternate attendance gave samurai the chance to “discover” the diversity of Japan and its culture that existed beyond the borders of one’s own domain. It’s hard not to agree with that. Also, Vaporis does mention that samurai, while stationed in Edo, did not have unrestricted freedom of movement and did not just idle away free time drinking and visiting pleasure quarters. While I do understand the point that Professor Vaporis is trying to make about this, it is undeniable that Edo was a “man’s town”. The popular pursuit of carnal pleasures by both samurai and townsmen alike helped to consummate the marriage of the culture of the “floating world” with that of the wider Edo period that we recognize today. If there is one weak link in this book’s armor, I’d say that the lack of discussion about samurai patronage of Edo’s pleasure quarters is it. However, this is just a minor quibble that does not distract from the overall wealth of knowledge one can gain from this book. 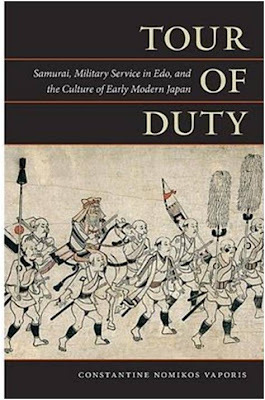 I also think it is worthwhile to note that Tour of Duty is packed with black and white photos and illustrations that help the reader visualize the rich landscape that Vaporis paints, whether it be of daimyo processions, domain compounds, or photos of archeological excavations and artifacts. 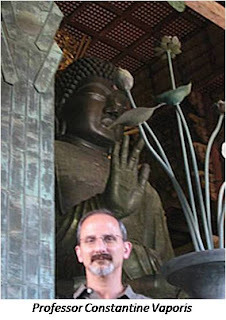 In an upcoming interview with Professor Vaporis that will soon be published simultaneously on the Shogun-Ki blog as well as the Samurai Archives Citadel Forum of Japanese History, we will be going into more detail about his research, his book and perhaps his thoughts on samurai patronage of the pleasure quarters as a way of alleviating some of the tedium that accompanied tours of duty in Edo. Please be sure to be on the lookout for the interview. In conclusion, I believe that Tour of Duty is an essential “must read” for anyone with an interest in the lives of the Japanese warrior class during the Tokugawa period as well as those who are fascinated by what it must have been like to travel on one of the five major roadways of the Edo period, such as the Tōkaidō. I’m finding it hard to find serious fault with this work. The topic is interesting. The writing style is clear and straightforward and engaging. The research is impeccable—one look at the extensive bibliography shows how deeply Professor Vaporis dove into researching this topic and the nearly fifty pages of detailed and informative endnotes are testament to this. I’m giving this book five out of five Smiling Sammies. Thanks, Leak. Professor Vaporis' book is a great read. However, before you shell out $50 for it from a second-hand seller, wait a few days-- we should have a better idea if Amazon will have more in stock soon. If the answer is positive, I'll post something on the SA. You can always buy directly from the publisher, the University of Hawaii Press... By the way, the author doesn't make a penny off of sales until the first run sells out. Even then, I won't be retiring any time soon! I just wanted to note that when you search for "tour of duty vaporis," as I just did, on Google Books, a link to this blog post comes up attached to the search result for the book. Congrats on the visibility!